If I could hire Mathilde Laurent to create a perfume for me based on a time of day, I’d choose dawn. My fragrance — I’ll call it la Naissance du Jour1 in honor of my favorite Colette novel — would evoke happy, and quiet, endings (the last breath of a day that will never return) and the fresh possibilities of the new day that’s just beginning. My fantasy perfume would start off dark (full of Mysore sandalwood, cedar, cypress, agarwood) and turn “bright” like a rising sun (with notes of iris root, sharp, green stems and leaves, galbanum, rain-drenched narcissus blossoms, and vibrant citrus — tangerine, lemon, bergamot). My perfume would be a revelation and its “development in reverse” a miracle — I’d never tire of the fragrance (and not just because it would cost me approximately $80,000). “Haute,” “connoisseurs,” and “exclusive,” “exclusive,” exclusive! The Cartier team has its talking points down-pat. But flattery will get you nowhere with a true perfume lover. I’ve never bought a perfume (or anything else for that matter) due to personal flattery (“That looks GREAT on you!”) and I cringe if someone fawns over me in a shop or calls me a “connoisseur.” Pound me with marketing jargon about “exclusivity,” connoisseurship and the like and I begin to wonder if what you’re offering is a good product or the selling of an “idea” (exclusive — expensive, hard-to-find — fragrances). Lately, I’ve been a bit grumpy as perfumers and venerated fragrance houses remain quiet and passive in the face of IFRA rules and projected bans5 on some of the most gorgeous ingredients used in perfumery. As a group, perfumers seem particularly mute and docile (they DO work for the big business aroma-chemical companies). Where’s the big-name rebel? Or the “Nose” that defends perfume’s “rights”? I’m not inclined to philosophize about perfumes and I am now, as I prepare to sniff Les Heures de Parfum, in what I’ll call L'Heure de la Clarté4 — my time of stringent appraisal. When it comes to fragrances, I search; I find; I smell; and I decide (like it, love it, hate it, boring, can’t smell it…). I L’Heure Promise “represents a moment of possibility”; its notes include petitgrain, fresh herbs, iris, sandalwood and musk. L’Heure Promise opens with a soft and beautiful petitgrain and iris accord mixed with a “dry straw” aroma (and perhaps a thread or two of saffron); citrus-y iris hangs in there for about 30 minutes before the perfume enters its clean, sheer, floral-musk phase. L’Heure Promise is pleasant and sophisticated in style, but ‘the moment of possibility’ represented by those great top notes does not, in the end, produce a satisfying perfume experience. L’Heure Promise’s pretty and spring-scented opening is fleeting and leads to a dry-down of nothing-special musk. L’Heure Promise stays close to the body and has so-so strength (you’ll need to reapply during the day). VI L’Heure Brilliante “was inspired by high-energy nightlife and neon effervescence” and includes notes of lemon, flaxseed, gin and aldehydes. L’Heure Brilliante begins with bubbly aldehydes and lemony gin — a good start. The lemon top note reminds me of “original” Monsieur Balmain: delicious lemon, lemon and more lemon. Slowly, L’Heure Brilliante’s sparkly lemon juice turns bitter, like unripe, sour citrus rind mixed with a fresh, dill-like aroma. During this phase, I begin to smell an undertone of what I believe is flaxseed (smelling of uncooked oatmeal). Surprisingly, lemon blossom makes an unexpected, pleasurable appearance when you least expect it and leads to L’Heure Brilliante’s final stage — a honeyed flaxseed aroma. L’Heure Brilliante stays close to the body and has Eau de Cologne power, yet L’Heure Brilliante smells more complex (up close, on skin) than most citrus perfumes; it’s my favorite of Les Heures de Parfum fragrances. X L’Heure Folle was inspired by Cartier’s Tutti Frutti jewelry collection, and the notes feature red currant, pink peppercorn, grenadine, blueberry, blackcurrant, blackberry, violet, leafy notes, ivy, boxwood, shiso, aldehydes and polygonum. L’Heure Folle presents brash/artificial-smelling, jam-‘berry’ aromas upon application and there is also a touch of greenery (ivy); L’Heure Folle’s green notes intensify during the dry-down, but there’s still some “sugar” in the berry mix. L’Heure Folle is a linear fragrance, and its heavy, never-changing berry accords (not even alleviated by the sheer musk in the base) hang heavy on me all day (like a weighty sweater wrapped around my shoulders that I want to toss off). L’Heure Folle has excellent sillage and lasting power — figures, it’s the fragrance in the collection I’d NEVER wear. 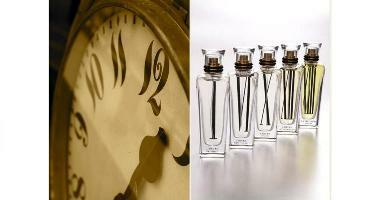 XII L’Heure Mystérieuse contains notes of jasmine, patchouli, elemi gum, coriander, incense, frankincense and juniper. L’Heure Mystérieuse begins with musty notes of patchouli and elemi gum; there is also a touch of “menthol-citrus” from coriander and a barely there minty note. Quickly the composition smells like “incense-flavored chewing gum”…sweet and almost edible. Juniper is discernible and it blends nicely with a smooth, refined, nearly-smokeless frankincense aroma. L’Heure Mystérieuse dries down to a rather dusty/flat and one-dimensional scent: there are hours and hours of never-changing gray-ashy frankincense-incense. Near the end of its development, I detect a similarity between L’Heure Mystérieuse and Cartier Roadster. XIII La Treizième Heure is described by Laurent as “olfactive trickery, like a crime with premeditation”; the notes include leather, maté, birch, narcissus, bergamot, patchouli and vanilla. I love leather-birch notes in perfume — and what smells more wonderful than narcissus (to me, not much). I thought of all Les Heures de Parfum fragrances, THIS would be the one I’d enjoy most. La Treizième Heure begins with smoothest leather, Lapsang Souchong tea and birch notes that quickly meld into a “sweet-smoke”/medicinal-smelling accord — then there’s the fade-out to plain-and-simple vanilla-patchouli in the base. Where’s narcissus? Perhaps a dog or cat could detect it — or a connoisseur — but not me. Something about this perfume reminds me of the scent of hospital waiting rooms. Cartier L'Heure Promise, L'Heure Brilliant and L'Heure Folle are Eaux de Toilette; L'Heure Mystérieuse and La Treizième Heure are Eaux de Parfum; all scents are $255 for 75 ml. For buying information, see the listing for Cartier under Perfume Houses. Over the next four years, eight more perfumes will join the collection. 2. Women's Wear Daily, 5/18/2009. 5. For background, scroll through the posts tagged "IFRA". Note: Hourglass image via Wikimedia Commons. Clock face at top is Old clock [cropped] by macinate at flickr; some rights reserved. I feel like I just saved $225. On the other hand, I really want a bottle of Le Dawn de Kevin. It’s too bad that with the intriguing names and hefty price tag, Cartier didn’t create scents that are appropriately memorable and enticing. Great review! Kevin, I am quite relieved to find you as moody as me about these. I thought I was the only one not bowled over. There was a lot of talk on the blogs about how they were as good as or better than the Van Cleef & Arpel exclusives, which startled me. I did not even find them more original (Mysterieuse reminds me of SL Borneo 1834, for example.) I like Brilliante best, too, and I liked 13 a bit better than you did, but otherwise was surprised to find myself relatively unmoved. Loved Laruent’s work for Guerlain, so I am surprised. Perhaps I’m grumpy about the cost, I don’t know. Erin: there’s a lot going on with these, promotion wise, and the pricing does seem “off” for what you get (even with packaging). “Something about this perfume reminds me of the scent of hospital waiting rooms.” Ouch! I’ve tried two of these (XII and XIII), and while neither of them struck me as something I had to have, I thought XIII was the nicer of the two, just not really me. (I’ll have to try it again with that comment in mind though!) It was surprisingly sweet, like a sweet tar, and also with something like hay, and it reminded me a bit of Chergui for a while. I want to try Brilliante too, but I doubt I’ll be rushing to buy any of them! Janice: XII worked better on me than XIII, for sure. I wore Chergui the other day and appreciated it more than I have in the past. Tastes change…! Yeah, I’ll pass. I don’t think “Nice” is what I want to wear. turbovivi: some prefer “nice” to “WOW!” or “YIKES!”…but I’m not one of them…esp. for almost 300 bucks. Oh good. Now I don’t feel as if I’m missing out too much by not having sniffed these yet. Kevin, I’d love to try your Dawn fragrance. Have you thought about submitting it in the Basenotes brief contest to design a BN fragrance? I hope you do! It’s a great idea. If I had an ounce of creativity, I’d submit a brief myself. At the very least, I hope to participate in the sampling. BC: thanks for the link! None of these really did it for me… XII was the nicest, after the indolic opening on me, but nothing I’d spend big $$ on. I didn’t like the Van Cleefs either for that matter. After all the rave reviews I’d read, I was expecting to love them, but it wasn’t to be. I am a fan of the XIII. I love the smokey tea / leather / floral combo on my skin. I did splurge on a bottle and I have no regrets. I even got 2 compliments while wearing this one evening at the Cirque de Soleil “O” show in Las Vegas last month. I did not care for any of the others. I found them thin and just not for me. My husband loathed the sample of XII. Dawn: that must really BLOOM on your skin to have people at Cirque notice! I also want to smell the Eau de Kevin (la Naissance du Jour). I’ll pass on the Cartier’s. Miss K….if only I could whip it up myself. Kevin – I always love your reviews. Now tell us what you really think! I’ve only tried XII and XIII – both of which I liked. However XII disappeared fairly quickly on me (and I’ve got skin that will hold onto scent through showers!) and XIII was almost identical to Le Labo Patch 24, which I have a decant of. I liked Patch 24’s vanilla drydown better though. Rappleyea: my skin holds onto fragrance too…and I had the same problem as you, even with a generous application. No Cartier for me please. Thanks for the review. Delfina…yes, we need more for such prices. Thanks for the hype- and hyperbole-free reviews, Kevin. We can always count on you for the straight (in a manner of speaking!) goods. For my hard-earning coin, I’d rather spend my money on one of the Guerlain l’Arte et la Matieres, or the relatively bargain-priced VC&A Bois d’Iris or MFK Cologne pour le Soir. Just one girl’s opinion. You can add me to the list of people who want a bottle of Eau de Kevin. Full of Mysore sandalwood? YES! Kevin- The only Cartier fragrance I wore was Must de Cartier back in the early eighties. Oh, I felt so grown up and decadent wearing my Cartier. It was not bad, a tad bit green on the opening, but alas, not much staying power. Dolly: I never smelled that one in its original formulation…the new Must doesn’t do much for me….men’s or women’s. I was wondering about these— tested the new VC&A set, fell in love with Bois d’Iris, bought it, and am now scared of testing new spendy scents. —-but these sound uninspired, thin and generally meh. Okay, maybe they are ‘nice’ but in my book; nice tops out at about a third of the asking price of these. I haven’t looked, but I’ll bet that even a sample set of these costs a pretty penny (or ten) …so I’ll pass. It seems the many repetitions of the word ‘exclusive’ is supposed to whip the consumer into a needy froth….I’m afraid it just awakens my antagonistic side. Daisy…Cartier should have gotten out the Thesaurus…too many EXCLUSIVEs! If you’re interested in them, do as I did, get a friend in NYC or LA to nab you samples from the source. I will be the third to say “Ouch!” I did fall in love with the XIII — in fact, I even DREAMED about the damn stuff last night! — perhaps because it’s the only fragrance I’ve ever tried that really captured lapsang souchong (Tea for Two is a sickly sweet mess on my skin). And it did a neat progressive drydown on me, veering from the tea to the flowers (beats the heck out of me if they were narcissus, but they were definitely there) to the smoky vanilla. Oh well, no accounting for taste, as my mother used to say! And speaking of accounting, I wonder if perfume could ever be considered a business expense… $255 is a big old “ouch” indeed. lilydale: maybe we could deduct perfume from our taxes if we lived in France! HA! Kevin, I love the introductory part of your review. It seems “exclusivity,” like the Emperor’s clothes, is often very much a state of mind. Thanks also for pointing out the muteness of most perfumers regarding IFRA regs. L’Heure Folle sounds to me perfect for nouveaux riches “Real Housewives of New Jersey” types who revel in their conspicuous consumption. I say this as a completely non-riche pleb, of course. I’ve heard a lot of good buzz about La Treizième Heure and I’d still like to try it because it sounds interesting (but no narcissus?! pity!). You’ve totally piqued my interest in L’Heure Brilliante, but I can do without the dill note! I actually eat oats with flaxseed most mornings, and I find that type of cereal or grain note to potentially be quite interesting, especially with lemon blossom. I’ll keep X and XIII on my “to sample” list. I’m in the NJ motherland now (speaking of real housewives) and plan to be in NYC once or twice. Maybe I’ll waltz into the Manhattan Cartier with an air of ENTITLEMENT to some samples! That’s great, Joe! Let us know what happens! Oh, good. I’m sure they’ll happily give you samples. And enjoy the Motherland…for the holidays? Haha.. an entertaining and kind of roundabout set of reviews. Bit disappointed, the new Van Cleef and Arpels collection had restored my optimism in these new niche collections (after the D&G mess). The first two hours (Promise/Brilliance?) sound nice to me, I might order some samples. I wish someone would go interview Fabrice from Le Labo or Frederic Malle or even go straight for JCE and force them to have an opinion on the ingredient restrictions. Birch tar, oakmoss, jasmine… these are some of my dearest friends! I’d love a chance to chat to Jacques Polge. I can imagine he is sick and tired of tinkering with his predecessors perfumes in order to make them meet the regulations. NWatts: I guess it’s like asking the poor relation to speak ill of the rich and powerful head of the family who shelters him: NOT WISE! HA! When I was little I used to love a gum called Fan Tan, with oriental-style lettering and a Chinese fan as the logo. It was pink, and tasted completely exotic. You reminded me of it with your incense-flavored chewing gum comment. Tama: just looked at some old Fan Tan adverts: nice! I enjoyed your review Kevin even though my experience of Les Heures was markedly different. If I had the money I’d certainly buy XII and XIII (I got narcissus!) and would consider the dawn one because to me it smelled like Heure Exquise without the rose. They are spendy perfume essays to my mind, quite beautiful. In addition (and I’m not, as a general rule, a bottle/packaging nut) they come in a stunning crystal bottle and leather case. donanicola: I know…all my bottles are in a dark cabinet so any fantastic design is wasted..so I’m never swayed with “deluxe” packaging either. Tommasina: yep, we are in the minority it seems. I am sooo glad for this review. When I finally could test this so-much-buzzed about collection I was totally, completely, underwhelmed. Only two fragrances were not deemed useless from the very beginning, la troisième heure and an earlier hour: the one with the iris opening. Because I was slightly afraid of how la XIII could develop (it seemed quite strong on paper), I made the mistake of choosing to give skin space to the iris one. The iris linger for few minutes and then I was left with a total scrubber, toxic and absolutely unpleasant if ever there was one. I kept the blotter of la XIII, and it seemed it did develop nicely – on skin it might be difefrent though. All the other bottlers didn’t even make it out of Cartier. It is the second time that the same bolgs give their unconditional praise to lines of mediocre output. Another false praise of entire lines, and I’ll start questioning wether knowing the perfumer and interviewing her/him might cause serious objectivity problems to some bloggers. I’m wicked? 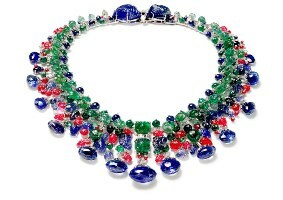 No more than these Cartier “pissed off art” (they were supposed to be pieces of art, weren’t they?). I fear I’ve been a bit too gumpy…. Whatever, your review made me happy. Zazie: you know grumpiness is ALWAYS allowed at NST! Yay! Another fragrance line I don’t need to try! My bank account heaves a sigh of relief. Thank you, Kevin, for the honest and very descriptive reviews. None of these grabbed me enough to try, never mind consider a full bottle, and that’s always good to know given the veritable ocean of new fragrances and fragrance lines that abound as of late. AbScent: I know; this time of year I start to ponder the “Best of 2009” and realize how many scents I never got around to sampling! I’m still early in the stages of getting to know perfumes but I feel better now since I thought I was completely “missing” these scents. Not sure what might have evoked the comment but my 12-year old niece thought XIII smelled like pizza?! nicolibba:maybe that touch of smoke reminded her of the wood-burning pizza oven????? HA! Kevin, you have a wonderfully diabolic way of making me long for the impossble… I want ‘La Naissance du Jour’, and still want to know what that mystery perfume is that you are hunting the globe for (the one that bore some similarity to Courvoisier’s L’eau imperiale). Ha — you thought we’d forgotten. I am also repelled by hype. Seems very poor taste to boast of exclusivity. But I will give the Cartiers a sniff when I have the opportunity. Annunziata: it was strange to read Cartier BRAG so in its interviews! When you log onto Cartier.com there’s Maria Callas singing “Casta Diva” (the most overused aria in movies, ads, etc) so they are rather predictable at times. I tried XIII and liked it very much. After several days, it was still present on the perfume card I was given so I suppose the quality of the raw materials used is very good. However, I realized after a while it reminded me of another scent and found out that was Armani Privé Cuir Améthyste only smokier. Anyone agree?! “Crime with premeditation”? That’s a first for perfume.